I wanted to make a new chicken dish that used sage, since I needed it for another recipe I was making and had some left over. 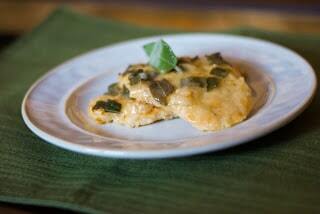 I came up with this Chicken in a White Wine Sage Sauce and it was perfect! I served it with some rice (because my family likes to add whatever sauce I’m cooking with on top of it! ), Maple and Sage Glazed Petite Carrots and a tossed salad. 1. Slice the chicken horizontally into halves or thirds depending on the thickness. (I got a total of 14 pieces of chicken with mine); then pound them to make sure they are even in thickness. 2. Add 1/4 cup of flour to a bowl and dredge the chicken in the flour. 3. Heat the butter and olive oil in a non stick saute pan and when hot, add the chicken. 4. Fry on both sides until lightly browned and cooked through, then remove and place in an oven safe baking dish. Repeat until all pieces have been cooked. 5. In the same pan, add the 2 tbsp. flour to form a roux; then add in the chicken broth, wine, sage and mustard. 6. Mix well until it starts to become slightly thickened; then pour over the chicken. 7. Place the chicken in the oven and bake at 350 degrees for 15 minutes. Makes 14 pieces. The official name for sage is ‘Salvia Officinalis’. It is a shrub-like plant with a slightly peppery flavor, woody stems, grayish looking leaves, blue-purple flowers and is native to the Mediterranean region. Not only is sage wonderful to cook with, it also has medicinal purposes including to heal snake bites, increasing a women’s fertility, antisweating agent, and making essential oils. YUM! I’ll have to incorporate this into our meal plan when I get back! Thanks for posting it. Glad you like it Christie, thanks for stopping by!